Pakistan’s Prime Minister Imran Khan has attacked hardliners and appealed for calm after the acquittal of a Christian woman convicted of blasphemy. In a televised broadcast, Mr Khan said hardliners were “inciting [people] for their own political gain”, claiming they are “doing no service to Islam”. 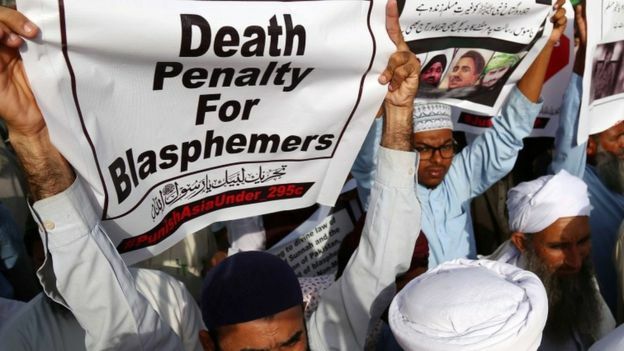 The landmark Asia Bibi case has already set off violent protests by hardliners who support strong blasphemy laws. Her lawyer has told the BBC she would need to move to abroad for her safety. Asia Bibi was convicted in 2010 after being accused of insulting the Prophet Muhammad in a row with neighbours. Wednesday’s verdict by the Supreme Court triggered demonstrations in Karachi, Lahore, Peshawar and Multan. Clashes with police have been reported. A leader of the hardline Islamist Muhammad Afzal Qadri, said all three Supreme Court judges “deserve to be killed”. The Red Zone in the capital Islamabad, where the Supreme Court is located, has been sealed off by police.